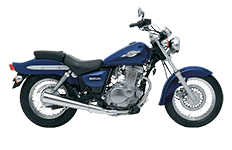 Although a bit smaller and more adaptable for riders of all skill levels, Suzuki's GZ250 Marauder motorcycle still packs quite a punch for a motorcycle of its size. Whether you're a daily commuter or like an adventure far away from home, you'll likely need an optimal pair of saddlebags in order to take on the day. We feature a full collection of Viking Bags made specifically for use with this motorcycle, so you shouldn't have any trouble installing any model featured here. Just browse through each of the models to learn more.